Collins Booksellers - Advances in Down Syndrome Research by Gert Lubec, 9783709167212. Buy this book online. 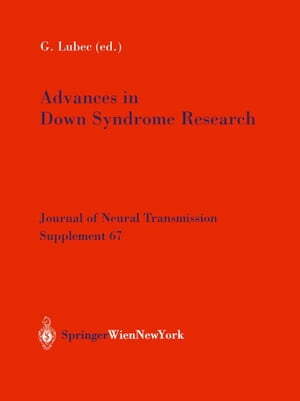 "Advances in Down Syndrome Research” represents updated research in several areas of Down Syndrome (DS). A new promising animal model of DS is reported and this opens new opportunities to study pathomechanisms and pharmacological approaches as it is more than difficult to carry out studies in humans and the clinical features are highly variable. In terms of biology, cell cycle and stem cell studies and in terms of biochemistry, relevance of studies on a specific protein kinase, channels, transporters, superoxide dismutase, antioxidant system, chromosome assembly factor and other important biological structures are provided. And again, the gene dosage hypothesis is addressed and although the vast majority of chromosome 21 gene products is unchanged in fetal DS brain, a few specific chromosome 21 encoded structures including transcription factors are indeed overexpressed although findings in fetal DS are different from those in adult DS brain when Alzheimer-like neuropathology supervenes.